For centuries women have used Henna culturally, magically and ritually to enhance their sexuality, to celebrate their inner Goddess, and to protect themselves or their loved ones. Henna body art brings luck to those who wear it. Mehndi marks a right of passage in a woman's life- often the Henna stain is deep red in colour and is therefore associated with the sexual initiation into womanhood. Henna, in essence, is an Oracle; the word Mehndi originally meant religious Guide. A Henna session is a powerful union that brings positive transformation and shields against destructive forces. We focus on kindness, compassion and goodness that lead to happiness, health and harmony. The receiver and I attune ourselves to the higher consciousness in order to seek manifestation with the Universe, creating positive energy to attract our hearts desire. WE ARE ONE! As with most art therapy, it's not about the final product...it's about the journey! Creativity is the gentle flow of energy that helpes me with challenges. Being creative is my special way to self-heal and rejuvenate by being in the zone, the magical creative link with our Creator. After a successful education in Bulgaria I immigrated to England when I was only 18 years old. It was the most difficult choice I’ve ever made in my life, but it proved to be the right one. 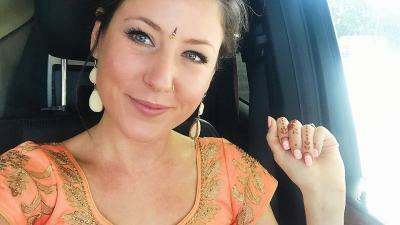 In the UK, I discovered Henna via my beloved husband and his amazing Indian family.Their grace, love and wisdom helped me find my true calling. I am providing individual and group henna treatments. I make beautiful multinational designs (African, Indian, Arabic, etc.) for all occasions and all age groups. My product is completely organic and the process is very Therapeutic (no black PPD chemicals). I would like to develop my classes into something more holistic and spiritual, because I feel like my work is not just a beautiful body art work for all celebrations. I have graduated from CCCU in 2014 with Fine Art and Management and I have been exercising different types of therapeutic art in the past 7 Years. Cancellation Policy: Session to be paid for on booking. 24 hours minimum notice is necessary for cancellation otherwise session must be paid for. Do you wish to learn the value of creative thinking and artistic expression? Wouldn't it be perfect to do it with friends or family while sharing an Indian-themed afternoon tea? To communicate with Your Subconscious Mind you can only use drawings, colours and aromas. I will help you access your Subconscious Mind and bring all unneeded feelings out of yourself. Or even if you have a group of non-artists who would like to learn the value of creative thinking and group creative expression? Utilizing the Concept of Mandalas and Henna in Art Therapy is what I offer. Sharing this experience with a group of people will allow you to memorise it for ever, it will increase every once energy and release all stress easily from the body. The very nature of creating a Mandala & Henna Art is therapeutic and symbolic. The shapes and colors you create in your Mandala Art Therapy will reflect your inner self at the time of creation. Your instinct and feeling should inspire and guide you through the process of creation. Ultimately, you will be creating a portrait of yourself as you are when creating the Mandala. So, whatever you are feeling at that time, whatever emotions are coming through, will be represented in your Mandala as well as shared with your friend/family or work colleagues at our secret space. The practice has tremendous benefits for the body, mind and spirit. The Mehndi artist is a powerful catalyst creating designs upon the wearer that can conjure a magical dialogue and transformation..
-decreases feelings of loneliness etc. -motivation to enforce feeling beautiful, important and positive. -you will also bring one beautiful freehand body art work with you, which will last for between 5 to 10 days.